Ciara Richards, the lovely Palm Springs, Cal. volleyball standout who announced her commitment to the Tigers by painting an AU on her African Tortoise, is moving to Auburn this week. And she seems as excited about her decision as ever. Richards received National Scouting Report’s SoCal Athlete of the Year award for outstanding academic and athletic achievements at an Auburn-themed sendoff last night at a Palm Springs soul food restaurant—at least it appears to have been Auburn-themed: Beautiful girl with a bright future in an orange and blue dress, proud parents in Auburn gear, Auburn flag… that’s Auburn-themed enough for us. 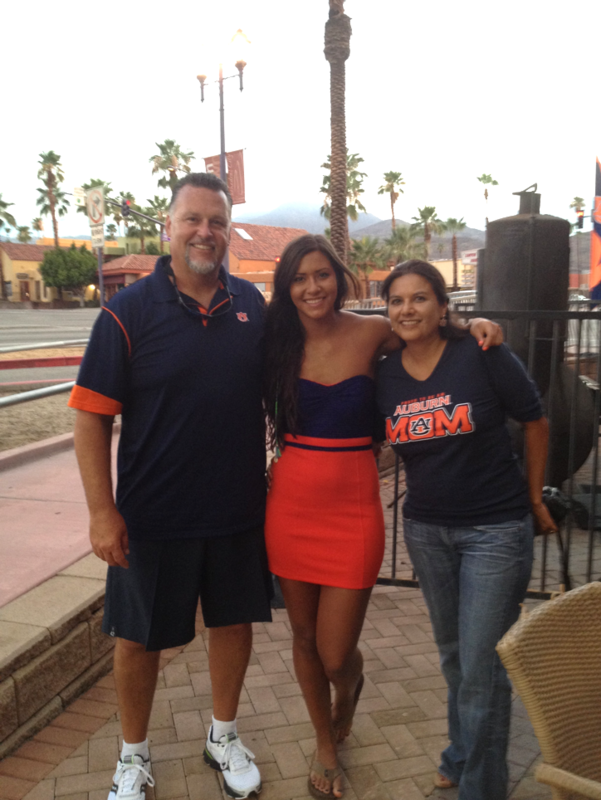 The 5’9″ setter for the Palm Spring High School Indians earned a full-ride to Auburn thanks in part to a 4.0 GPA. Those 43 serving aces, 24 blocks, 163 digs and 345 assists as a junior didn’t hurt either. During her senior season she logged 136 attack kills, 34 serving aces, 25 blocks, 116 digs, and 260 assists. No word yet on if she’s bringing Bo the Auburn Tortoise with her to the Plains. * Auburn dude makes Samford Hall out of 4,000 LEGOs.